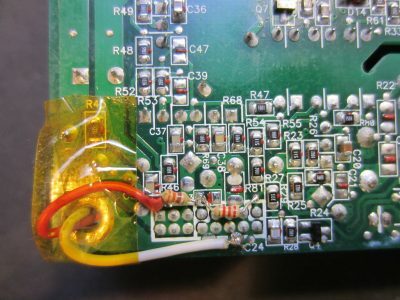 After taking the SMART UF-55 projector apart, I decided to take a look at the salvaged circuit boards to see whether I could re-use them to power the projector discharge lamp. Most of the modern projectors utilizes some kind of “smart” ballast circuits so that the main board could communicate with the ballast to determine the correct drive level given the required luminous level and monitor the operating temperature. So turning on the discharge lamp without the projector circuitry requires a bit more than just applying power. 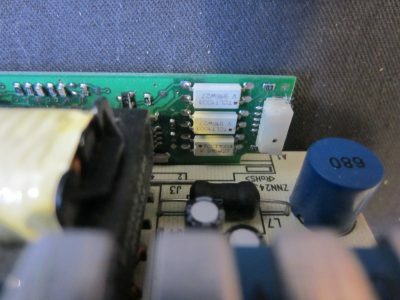 The ballast board inside the UF-55 projector uses OSRAM‘s P-VIP PC-UART interface board, which communicates with the main projector board to regulate the power going into the lamp. According to the application note, pin 4 (SCI/Sync) and pin 5 (DIM/RxD) are responsible for receiving commands from the host (e.g. the main board). The communication protocol is detailed in this document. The UART protocol used by the P-VIP lamp interface board is 9600/8-E-1 (Baud rate 9600, 1 start bit, 8 data bit, 1 stop bit and even parity bit). Using a logic analyzer, I captured some data on the RxD pin (pin 5) during the normal operation of the lamp (with everything connected except for the DLP assembly and the auxiliary board). Once the lamp has been turned on, a status check command (0xF5) is sent at a rate of roughly twice per second (note that the UART waveform is inverted because the LEDs in the optocoupler are configured as common anode). Here are the commands sent to the OSRAM P-VIP lamp driver during the initial power up. The commands were issued at an interval of roughly 10ms. After this command sequence, a status check (0xF5) is sent every half second until power off command is issued. The following is the captured power off command (0x26) which is always followed by a lamp driver reset command (0x3A). So the lamp ballast control can be easily turned on and off by simply sending 0x25 and 0x26 via UART. The querying commands are not necessary if the goal is just to power on the lamp. In fact, the lamp can be turned on more easily and no serial communication is required. According to OSRAM’s standardized UART protocol application note, the SCI signal has a higher turning on priority than the UART software command. This means that we can assert the SCI pin (pin 4) to turn on the lamp instead of issuing UART command to pin 5. And turning off the lamp is just a matter of removing the power. Depending on your particular situation, either way can be used to turn the lamp on and off. While asserting the SCI pin is simpler, using UART commands gives you a lot more flexibility if your goal is more than just on and off control. 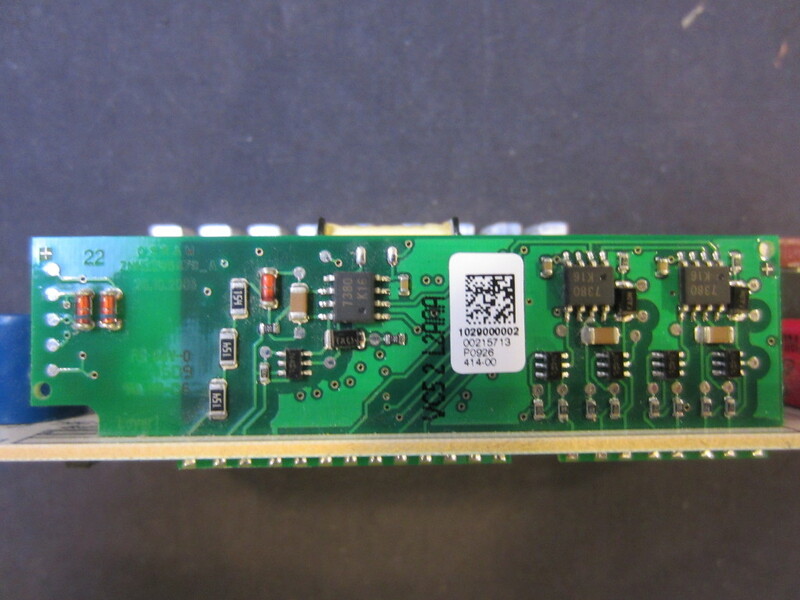 The main switching supply is controlled by the main board, so in order to operate without the main board, the power on pin needs to tied to 3.3V. So I connected a 2.2K resistor between the 5V stand by power pin (this voltage is always present when the power supply is plugged in) and the soft power on pin. Given the internal resistance present, this resistor value drops the 5V by roughly 1.5V so we get the 3.5V on the power on pin. 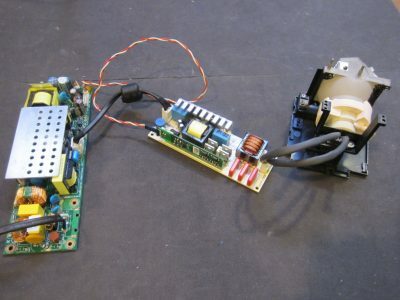 Once the power on pin is turned high, the high voltage inverter begins to work and the output from the high voltage connector should be around 385V. 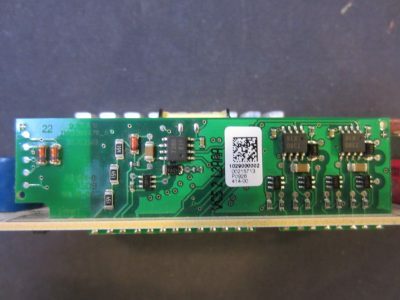 To assert the SCI pin (pin 4) on the P-VIP controller, we need a current limited 5V to turn on the photo diode (the photo diodes are common anodes, which means 5V needs to be applied to the common pin and the power supply ground needs to be connected to the SCI pin). This is achieved via a 330 Ohm resistor connected to the 5V rail. Note that this only works because the supply output does’t not share a common ground with the P-VIP controller board. Otherwise, an external power supply would be needed. Here is a picture showing the minimum number of connections required to power the discharge lamp. And here is a video showing the lamp in action. Great Video! I have the same osram pvip lamp driver, from an Emachine v700 Projector. From what I can see from the video most of the componets look similar. But what I’m trying to do is trick the mainboard into thinking the lamp is good. The plan is to replace the lamp with an 100w LED chip with its own LED driver. Any ideas would be greatly appreciated. great stuff. I have also the same purpose like Erik (Nov.15,2016) with a Benq W1500. If you see a possibility, please let us know. Good day! Interesting videos. I,m from the Philippines, and I have same suggestion as Erik’s and Arnold’s with an Infocus X6 DLP. Thanks and more power! Sorry, I don’t have access to the Infocus X6 DLP though. Thanks for your reply, what I’m trying ask is that “Can I trick my main board into believing that the projector lamp is ok and how? Its lamp driver is very much the same as yours Osram PVIP lamp driver board. I have the same question as Roberto, Arnold, and erik. I have the same OSRAM P-VIP Ballast Lamp Driver. I want to fool the projector into thinking the lamp is good and working, so I can replace it with an LED. Using the standardized OSRAM UART commands you linked to, could I simply use an Arduino Uno to emulate the P-VIP board? It could wait for a command from the motherboard, then send back the appropriate answer. the domestic 220 voltage. I used a separate mobile phone charger to supply its negative end to pin 3 and positive end to its pin 5. It enlighted the lamp and switching on or off the charger was putting the lamp on or off respectively. From the form I want to know the dimmer function. This just my hobby otherwise I am a general surgeon in India. Thanks. I found this topic fantastic, and thank Mr. Kerry. My ballast works perfectly, I have powered the 230V ballast with a diode bridge and filtered with a capacitor 150 mF 430 V, so without using the original projector’s power supply. Thanks for this great guide. I have an optoma projector with the exact the same ballast board but my power suply board is similar but not the same. I’m having problem finding the soft power on terminal. Could you guide me through this? One more question. Was it possible to run the projector without direct connection between the ballast board and the main board ? Did you tried it to see if the mother board functoin with this bypass ? I haven’t tried, but I believe you can’t do that easily as the motherboard monitors the states of the lamp and would shutdown should it detect any issues. Hello Mr. Wong, I’m interested in the opposite that you made, ie. running the proyector’s board and get rid of the high voltage unit, lamp, fan and ballast. The control board requires only gnd, 5v and 12v of power supply but I don’t know how to bypass the sensors to fool the board. Like several folks noted above, I would like to trick the projector main board into thinking the lamp is lit and running. I have a Sanyo PLV1080HD that I would like to outfit with a 128W LED source. If anyone has figured out the 5-wire solution, that would be most appreciated. 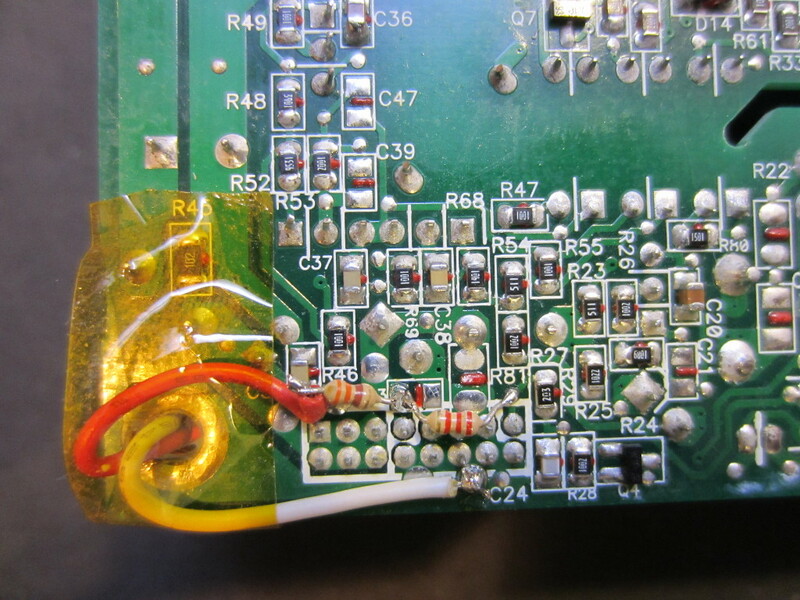 This person has cracked the 5 pin problem using a micro controller, the source code given can be altered to suit / Emulate many types of osram compatible ballasts here is the web address of the blog http://uvdlp3d.blog.hu/2017/01/13/emulator . 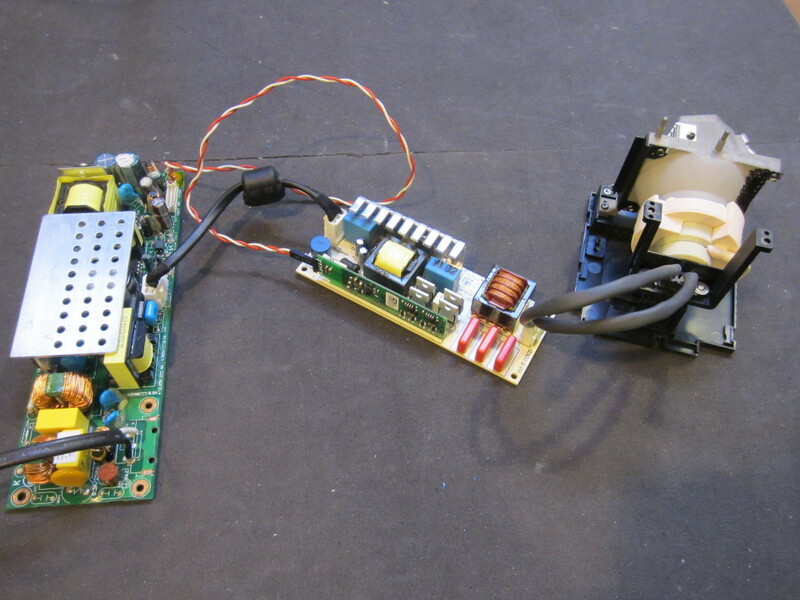 I have used the outline of the code to Emulate a Sanyo plc-xe33 projectors ballast after using my own rs232 sniffer circuit comprising a 74hc14 inverter ic to see what the projector was sending to and expecting back from the ballast. I’m also interested in doing this, and I’d love to be able to mimic the behavior of the ballast controller to fool the motherboard, but I’m afraid I’m not sure how to wire my FTDI USB-UART adapter to the thing, so I got another idea : what if, instead of fooling the motherboard with a fake OSRAM controller, we went into fooling the controller itself, keeping it in the loop ? Maybe it’s easier, since this controller obviously relies on analog data from the ballast, and the old technique of shorting one or two wires downstream (on the controller-ballast interface, where the controller is soldered on) would be successful ? Bob, Roberto, other’s, was anyone successful in fooling their VIP ballast board into thinking the lamp was there, on, and good? I’ve modified my Viewsonic lamp area with a UV fiber optic bundle and removed the color wheel for 3D UV printing. If I have to, I’ll dangle the HID light somewhere but it’s dangerous, no use, etc. Can u please tell me the voltage across the discharged lamp? It has 3 input voltage terminals and a logic board with 5 pin connector. Hi, do you still have these pdf documents? I can’t download it. Could you please sent it to me?